Attu Island is overdue for some spring cleaning. Seventy years after World War II, the island is still littered with shards of old Coke bottles, lead-based batteries, leaking fuel drums and unexploded artillery. This summer, the U.S. Fish and Wildlife Service, which manages the remote island as a refuge, will survey the extent of World War II debris and contamination. As KTOO’s Kelsey Gobroski reports, the entire ecosystem could be affected by the decades of pollution. Attu gave biologist Deborah Rudis goosebumps. Until her first visit to the island in 2007, Rudis had only seen Attu’s past while sifting through decades of documents for her job at Juneau’s U.S. Fish and Wildlife Service office. She plans to return this summer with a team of other scientists to catalog the clean-up work that needs to be done. Rudis says evidence of military occupation sticks around on Attu. During her 2007 visit, Rudis shared the island with a few Coast Guardsmen and two other biologists. Now the Coast Guard station is closed. She is a contaminants biologist and was on Attu to survey the pollution. She calls the hydrocarbon pollutants “product” because there’s more than just oil. “There’s bunker C and there’s lubricants and there’s different oils and there’s diesel fuels,” says says. World War II’s Aleutian campaign is sometimes called the “Thousand Mile War.” The U.S. military built a base on Attu and deployed 15,000 U.S. troops there. Rudis says about 2,000 Japanese soldiers dug into the ground or navigated caves for shelter. Cliffs and mountains separated the two bases. The U.S. retook Attu from the Japanese in 1943 in the only World War II battle on American soil. Rudis followed the trail of troop supplies while surveying Attu. She counted thousands of fuel barrels; many so rusted only the skeletal rings remained. 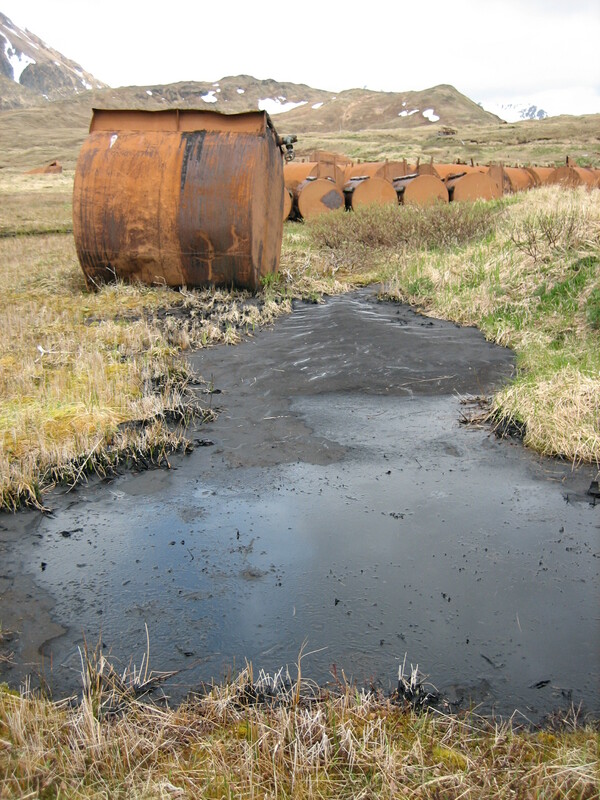 Their contents had pooled and solidified, creating an asphalt lot in the middle of the Aleutian tundra, an example of the pollution of war. Unexploded ordnances also litter the island, but are marked sporadically. Rudis says a Naval Disposal Unit tried to minimize the risk of explosive accidents, but the plan backfired. “They thought they could blow them up and it would neutralize them so-to-speak, but a lot of things don’t totally blow up, or they’re buried in the bottom of the pile,” Rudis says. 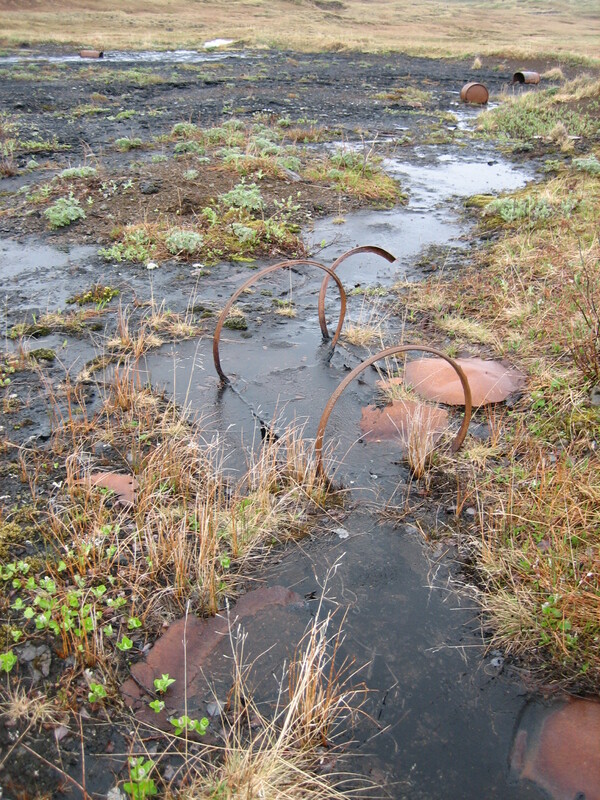 Attu is one of about 10,000 Formerly Used Defense Sites nationwide. The Department of Defense has about $250 million each year to whittle away at some of the 2,700 sites that need cleaning up. 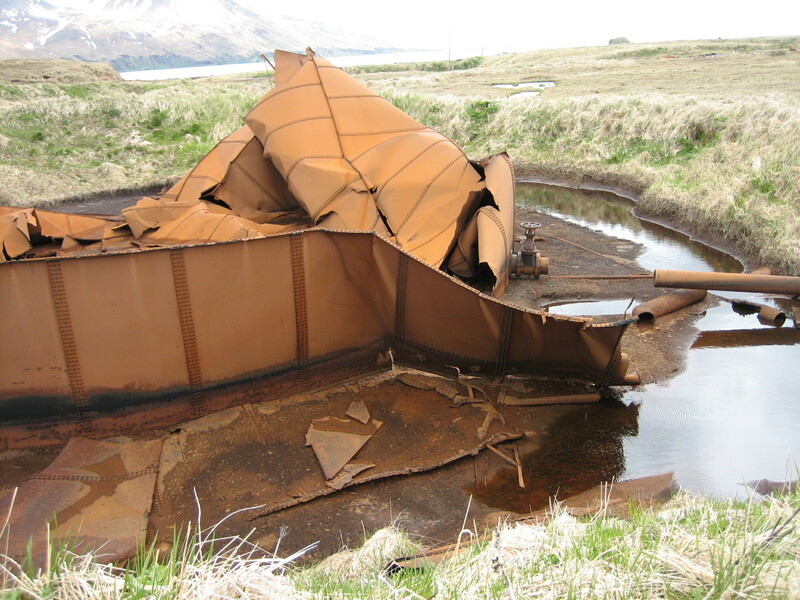 An Attu clean up could cost tens of millions of dollars and stretch out more than a decade. Kenneth Andraschko is the manager of Formerly Used Defense Sites in Alaska. He says it could be two to five years before an Attu clean up would get underway. The Fish and Wildlife Service will fund this summer’s survey. Fish and Wildlife Service historian Debbie Corbett will join Rudis and the other scientists this summer to survey old Attu battlefields for the first time. She has been to Attu before to study Aleut artifacts. “It’s sort of like a World War II version of Gettysburg, where you’ve got the troop movements and the actual battle. You can see where the battle was fought,” she says. Corbett says World War II artifacts weren’t seen as old or special enough to preserve until recently. She aims to leave things where they’re found whenever possible; where she finds an object helps her understand how it was used and what was around it. “I’m trying to get people to think of this as a landscape. Not just as isolated objects on the ground or a cluster of buildings or a runway, but the whole thing as a unified picture,” she says. This summer the Fish and Wildlife team will get to Attu by sea. The Coast Guard station’s abandoned runway needs a safety check before planes can land; the Corps of Engineers is making it a priority to clean up Attu before the runway decays – eventually reclaimed by the tundra.